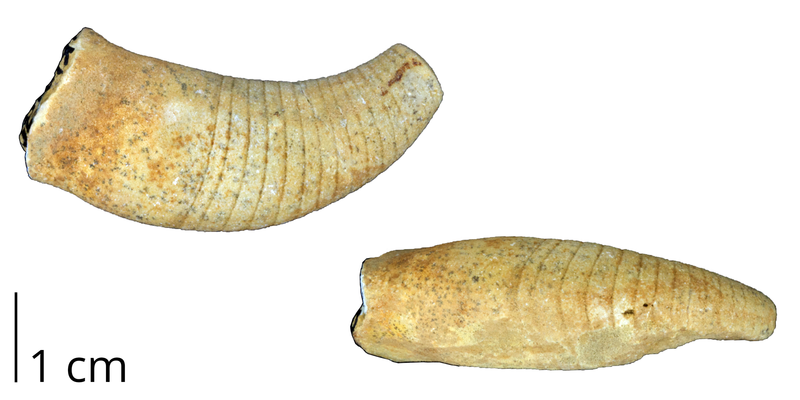 Above: A reconstruction of the Silurian stem-group cephalopod Phragmoceras (a Discosorid) (identified by arrow). 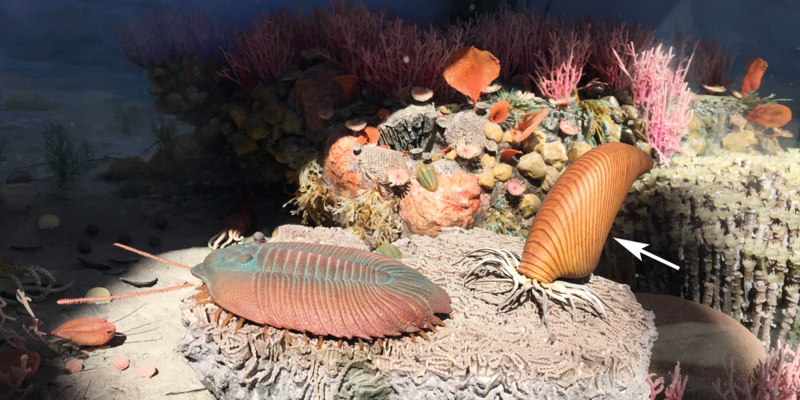 This diorama was once on display at the Smithsonian Institution National Museum of Natural History, but now resides at the Paleontological Research Institution, Ithaca, New York. Photograph by Jonathan R. Hendricks. Crown-group Cephalopoda includes the shared common ancestor of Nautilus and all extant coleiods (squids, cuttlefish, and octopods), as well as all of the descendants of this common ancestor, which is thought to have lived during the late Silurian (~416 Ma) (Kröger et al., 2011). A wide diversity of Paleozoic cephalopods are thought to be phylogenetically basal to the common ancestor of crown group cephalopods, making them stem-group cephalopods. In a recent review, Kröger et al. (2011) noted that a “repeating theme” among stem-group cephalopods was “the evolution of coiled conchs” and that “[s]imliar conch morphologies evolved repeatedly and independently in a number of lineages” (p. 607). Because of such evolutionary convergence, determination of phylogenetic relationships among different groups of stem-group cephalopods is challenging. Overall shell shape and internal shell features (such as the position of the siphuncle) are important for recognizing different groupings. Some examples of stem-group cephalopod taxa are the Discosorida, the Plectronocerida, the Ellesmerocerida, and the Oncocerida. Fossil representatives of a couple of these groups are shown below. Detailed information about Ordovician oncocerids from the Cincinnati region may be found on the Ordovician Atlas of Ancient Life. 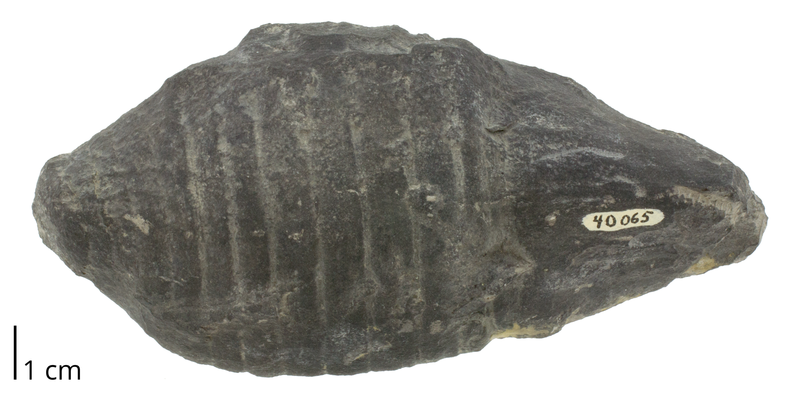 Westonoceras from the Ordovician Galena Fm. of Fillmore County, Minnesota (PRI 70364). This taxon has a cyrtoconic shell. An interactive 3D model of this specimen is below. Image by Jonathan R. Hendricks. Interactive 3D model of Westonoceras sp. from the Ordovician Galena Formation of Fillmore County, Minnesota. Specimen is from the collections of the Paleontological Research Institution (PRI 70364). Maximum length of specimen (not including surrounding rock matrix) is approximately 5.5 cm. A photograph of this specimen is immediately above. Model by Emily Hauf; Creative Commons Attribution-ShareAlike 4.0 International license (CC BY-SA 4.0). Cyrtoceras circumflexum from Bohemia (PRI 70325). Shell is a cyrtoconic longicone. Image by Jonathan R. Hendricks. Cyrtoceras aequale from Bohemia (PRI 70586). Shell is a cyrtoconic longicone. An interactive 3D model of this specimen is below. Image by Jonathan R. Hendricks. 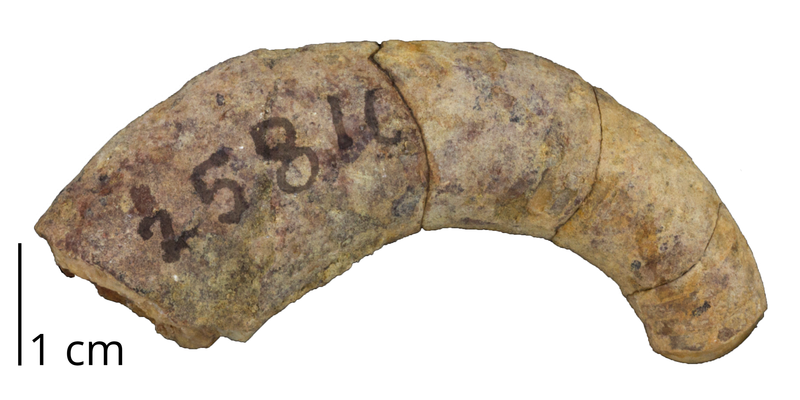 Interactive 3D model of Oxygonioceras aequale from the Silurian of Prague, Czech Republic. Specimen is from the collections of the Paleontological Research Institution ((PRI 70586). Maximum length of specimen is approximately 9 cm. A photogram of this specimen is immediately above. Model by Emily Hauf; Creative Commons Attribution-ShareAlike 4.0 International license (CC BY-SA 4.0). 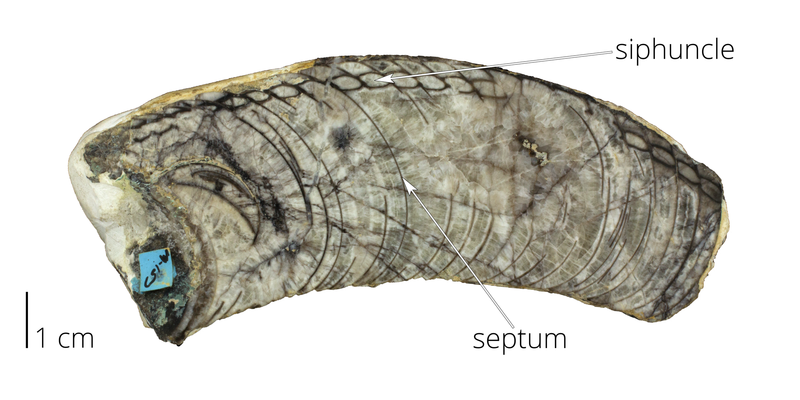 A polished cross-section of Cyrtoceras aequale, showing the position of the siphuncle near the shell wall. Specimen (PRI 70585) is from Bohemia. Shell is a cyrtoconic longicone. Image by Jonathan R. Hendricks. 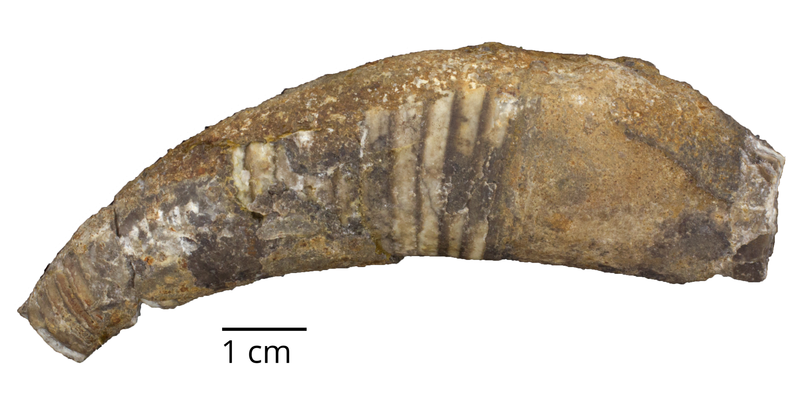 Beloitoceras houghtoni from the Ordovician Platteville Limestone of Beloit, Illinois (PRI 70320). Shell is an orthoconic brevicone. Image by Jonathan R. Hendricks. Acleistoceras fischeri from the Devonian Cherry Valley Limestone of Otsego County, New York (PRI 70588). The shell of this species is a brevicone. Image by Jonathan R. Hendricks. Gomphoceras? sp. from the Silurian of Czechoslovakia (PRI 70583). 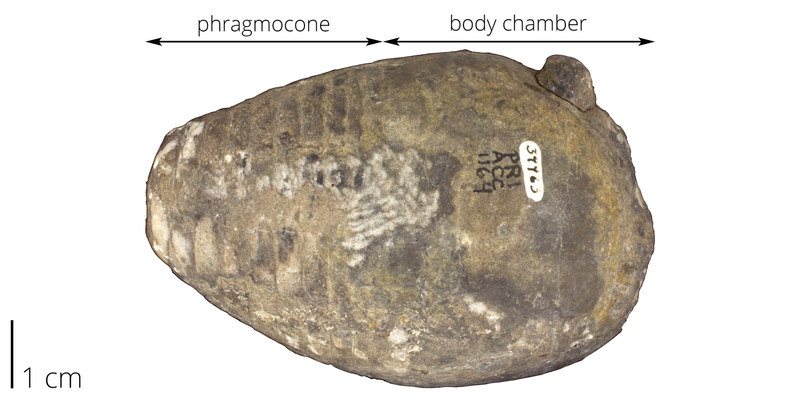 The shell of this taxon is an orthoconic brevicone. Note that the identification of this specimen is questionable. An interactive 3D model of this specimen is below. Image by Jonathan R. Hendricks. Interactive 3D model of Gomphoceras? sp. 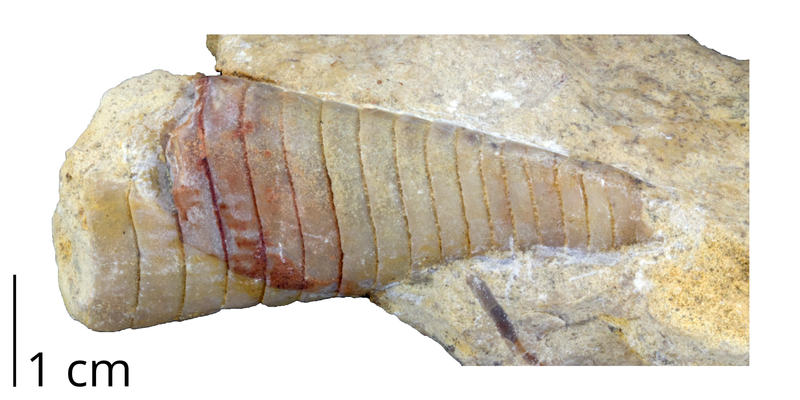 from the Silurian of Prague, Czech Republic (PRI 70583). Specimen is from the collections of the Paleontological Research Institution. Maximum length of specimen is approximately 7 cm. A photograph of this specimen is immediately above. Model by Emily Hauf; Creative Commons Attribution-ShareAlike 4.0 International license (CC BY-SA 4.0).